Stacy Horn » Blog Archive » Who is more oblivious? No one. 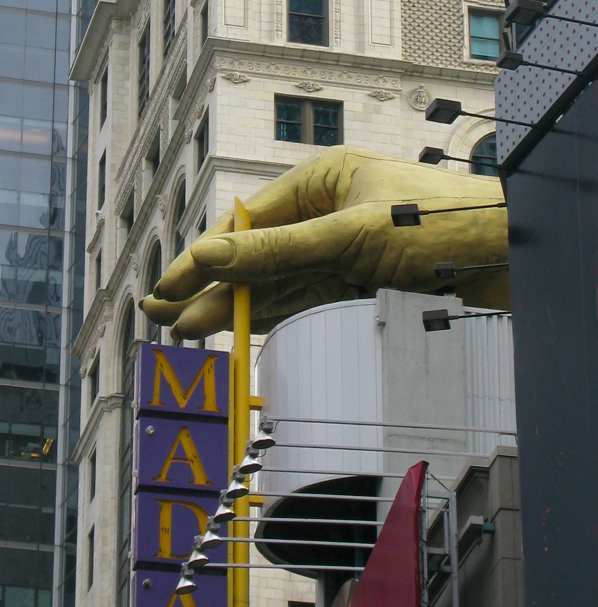 How have I missed the GIANT hand above Madame Tussauds wax museum all these years?? It’s a big freaking hand. It reminds me of the time I went to Staten Island to see one of the detectives I was writing about. It came out that I hadn’t noticed something about the barber shop we were in. So he started asking me questions about the other people inside, and the decor, etc. I couldn’t remember anything about the inside of the place. Not a thing. It was like I was never even in there. Elvis could have been getting his haircut and I wouldn’t have noticed. I would make a terrible witness. Whatever or whoever has my attention is the only thing that exists for me, apparently. I was interviewing him and I was oblivious to everything else. But come on, how did I miss this giant hand?? Well, how high up is the hand? As a short person, I’m always missing things that are above my range of vision; how often are you walking around with your head looking up? I think I remember from a Communications class that most people are terrible witnesses, hence the unreliability of eyewitness accounts or testimony. So don’t feel too bad! Yeah, every since I wrote my cold case book I am very leery about eye witness evidence. Hey Stacy, I just started The Restless Sleep. I’m only at the beginning, but it looks promising as an interesting read (though possibly a sad one). Piece of trivia that comes up in the first chapter or two. Massad Ayoob, one of the premier authorities on defensive shooting, said that when the NYPD used .38 rounds in their revolvers, a lot of perps got up after being shot. However, when they went to plus-P ammunition the perps stopped getting up. I’ve seen pictures from law enforcement sources of drug-addled crazies who have been hit dozens of times with 9-mm rounds and still had the capacity to return fire. My speculation is that plus-P .38 rounds are more effective than 9-mm rounds. I’ll let you know how I’m enjoying the book as I get deeper into it. I’m so nervous, I hope you like it. Thanks for the arms info, it’s morbidly fascinating. I thought the glock was … effective as they got!